THE horikiri-style ramen discovered by ramen connoisseur Teruhisa Shimizu of Japan is now served at the newly-opened Gokuraku Ramen in Mid Valley Mall. Its gokuraku soup is simmered to perfection for 27 hours with pork bones, chicken, fish as well as salt and Japanese soy sauce to create a flavourful and thick base for ramen compared to the 17-hour tonkotsu soup — regular pork bone soup — which is easily found in many restaurants. Gokuraku Ramen executive director Law Hwee Chee said the longer hours allowed better extraction of flavours, creating a more intense and unique taste. “Thicker noodles complement the gokuraku soup better because strong flavours might overpower the thin noodles which are more suitable for the tonkotsu soup. “The taste of the noodles must be savoured together with the soup and not overpower each other. We make our own noodles daily using our noodle-making machine which is visible through a glass panel from outside,” he said. Law added that there was a proper method of savouring the ramen to get optimum satisfaction. “First, look at the ramen and smell the rich aromatic broth. With the soup being the most significant part of ramen, scoop and sip generous amounts to start off. 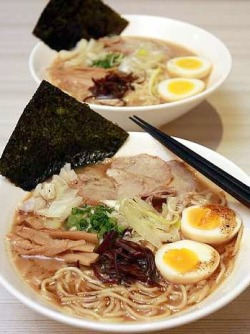 Hearty: The “Ultimate Tonkotsu Ramen” has extra char siew, flavoured eggs, soy sauce and garlic oil. “Then mix the noodles and soup well, except for the seaweed which you can munch at any time and slurp away,” he said, adding that it was best to consume it within the first eight minutes after serving. Accompaniments such as leek oil and chilli flakes could be added for extra taste. “When you are done with the noodles, gulp down the soup till the very last drop,” he said. The restaurant also serves appetisers and desserts to complement the ramen. “Appetisers such as Gyoza Dumpling (minced pork, vegetable and tonkotsu dumpling) and Pirikara Negi Char Siew (char siew slices with special homemade sauce) are not only great palate teasers but are also good food to go with alcoholic beverages. 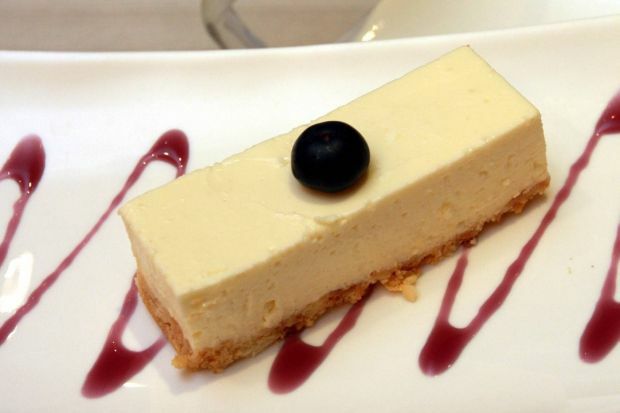 “Since ramen is a flavourful meal, it is good to have dessert to cleanse the palate like the Annin Tofu which is made from almond and coconut milk or our rare cheese cake with a hint of lemon,” he said. Besides ramen, they also serve rice meals. Until the end of the month, Goruraku is giving a 50% discount on ramen dishes on Mondays and Tuesdays and a 50% discount on side dishes with purchase of any alcoholic beverages.